I tell you, this corset sewing business has been just awesome! I am really enjoying myself and learning lots along the way. After making some small adjustments to my first muslin, I cut out all (32!) new pieces for the second one. I used some poly-blend upholstery fabric for the outside, and plain cotton muslin for the lining. I tried it on midway, and didn't feel it was the perfect fit. However, a corset without boning is a different animal to a finished one, so despite seeing some points for improvement, I decided to finish it just to get some practice with the grommets/eyelets, the waist tape, lining and spiral steel. I used continous spiral steel boning, cut and tipped them myself. It was not hard at all, and I recommend getting this opposed to the pre-cut lenghts. Cheaper, too! 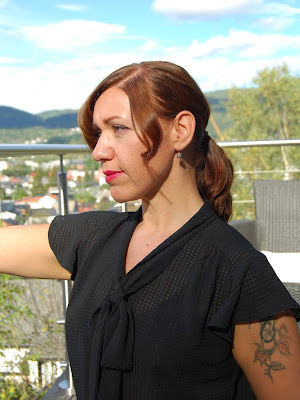 For this corset I used three meters of spiral steel. Uhm...is that a baseball bat up your back? I am quite pleased with the fit. When I tried it without the boning, it seemed too long because it doubled over itself at the waist, and it was also very loose at the bust. I switched from the A-cup bust gores to the B-cup on this muslin, and debated whether I should switch back again. I ended up keeping the Bs. After inserting all the boning, I see that the length is perfect and the extra room in the bust allows for tightening at the waist. Some reviews of this pattern claims that the bust gores are "all wrong" but I got my own opinion on this matter. I think, the gores are not meant for the boobage but rather for the ribs. They start just at the edge of my ribcage, and give me room to take a full breath (high in my lungs) and there is no excessive compression or hot spots over my ribs at all. My bust is nicely cradled within the corset, and there is no "spillage". If I am to be very critical, the outer gore could use just a teeny tiny adjustment to make it a tad more close fitting and give it a more correct curve. I am also a bit bothered by the way the bottom front edge sticks out, although this is probably invisible when wearing a gown (or even just the undergarments). When ordering my supplies, I was tempted to get a spoon busk, but some say they are notoriously uncomfortable. I opted for the regular straight steel busk for this first corset, but I *need* to try the spoon busk some time. Love the shape it gives! I can rather easily-ish lace this corset all shut, and it gives me a 27" waist, so a 3-4" reduction. I have at least an inch more of squish, but I am ok with the reduction that this corset gives me. 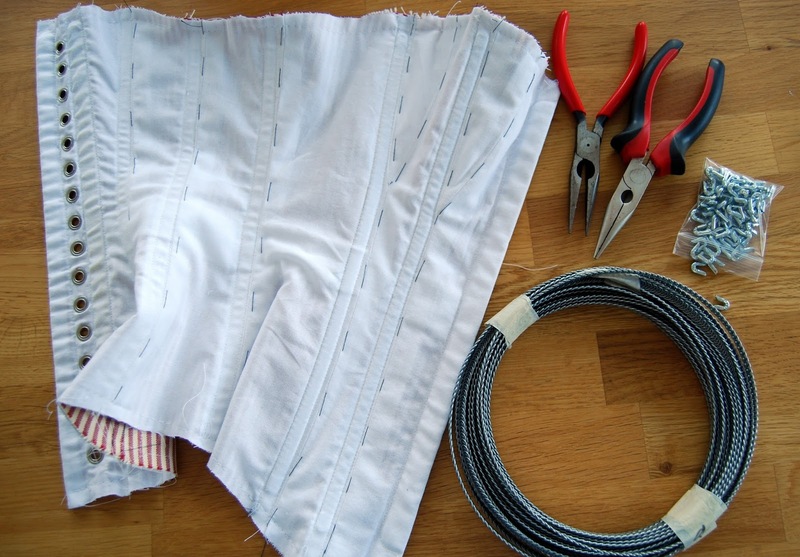 As I mentioned in the last post, I've dived into making my first Victorian corset! To be fair, I really should make the chemise and drawers first (the things that goes under the corset), but it turns out getting cotton batiste in my country is near impossible. I've found some cotton stuff that's fairly light weight without being a voile, but I'm still not sure it is light enough. But it will do as muslin for the chemise, I'm sure. I am also not finding the trim I want, so for now, I am tackling the corset. A thing of extreme beauty. 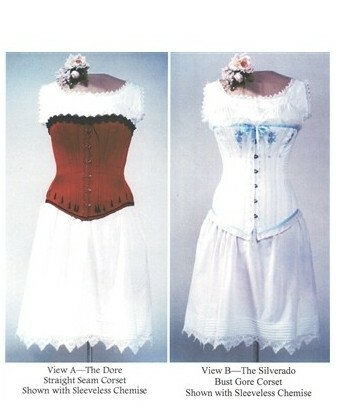 I opted for the Silverado corset (B), with bust gores. I immediately noticed how straight it looked, and after reading a few reviews I decided to add some width in the hips. I drafted the size 12 and added about 2" overall at the bottom. It sewed up like a dream, and it was fun setting the busk and seeing it take shape. I didn't add any boning besides the busk and one straight steel bone on each back edge. I didn't set any metal eyelets either, because I knew this corset would be taken apart again. 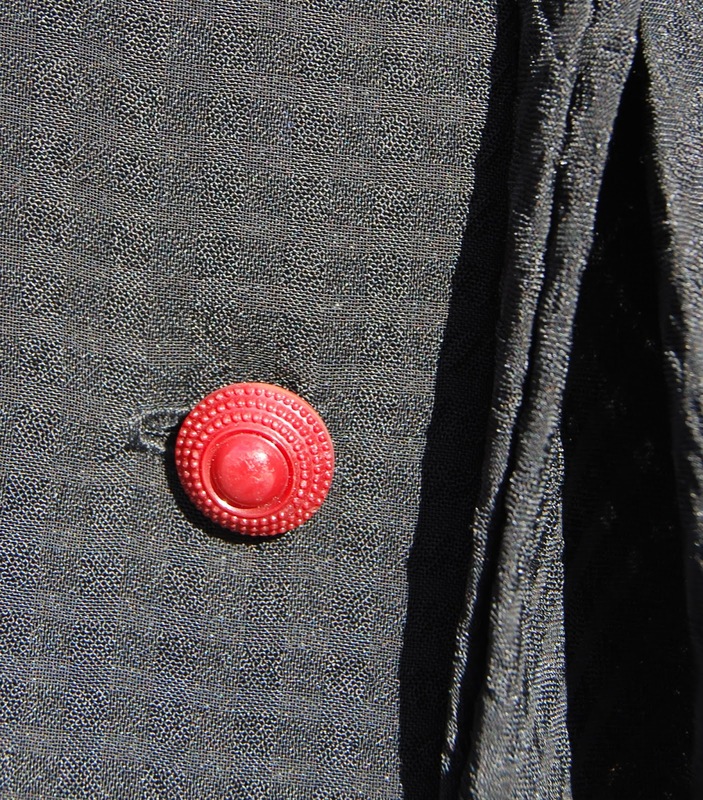 I made buttonholes instead, and it worked ok for the initial fitting. I used some polyester cord from the hardware store for lacing. So this is how the first muslin came out. It is buckling at the bust and twisting at the back, because it lacks boning, but also because it is a bit tight in the ribs, and rides down. The waist size is what I want it to be (I compared it with an underbust corset I have that has a great fit) but there's still too little room in the hips. 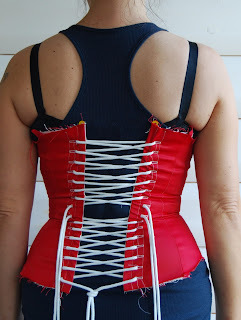 When tightening a corset, the waist will squish, but the hips won't to that degree because of your skeletal structure, so the tighter the corset, the bigger the hips get in relation to the waist. 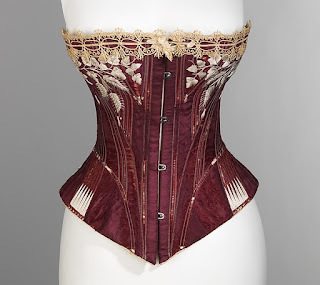 This also applies to the ribs, so the smaller the waist, the more flare you need top and bottom in the corset itself. I don't want it to lace all shut, but it may seem that it now has too big of a gap. All that will change once there is more room in top and bottom, so I am excited to try on the second mock up. 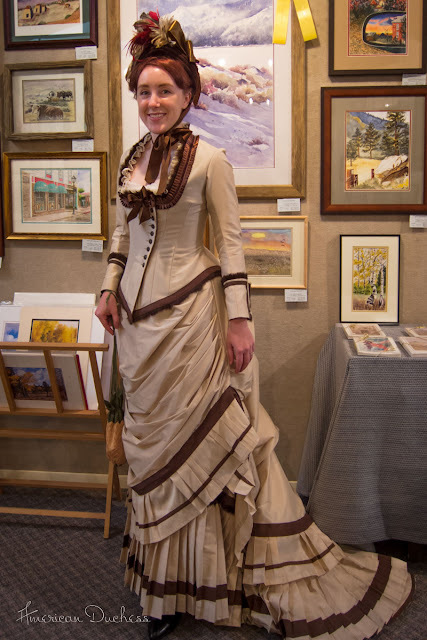 Since deciding to start on a Victorian outfit, my energy and motivation to create has gone through the roof! 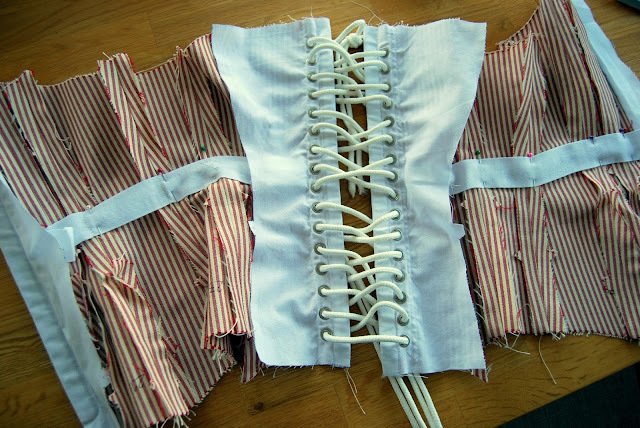 I am currently working on my corset, and it's good fun :) I might have some progress to show in a few days. But I did actually sew something in the more gloomy days of late August, there just hasn't been a chance to photograph it before now. 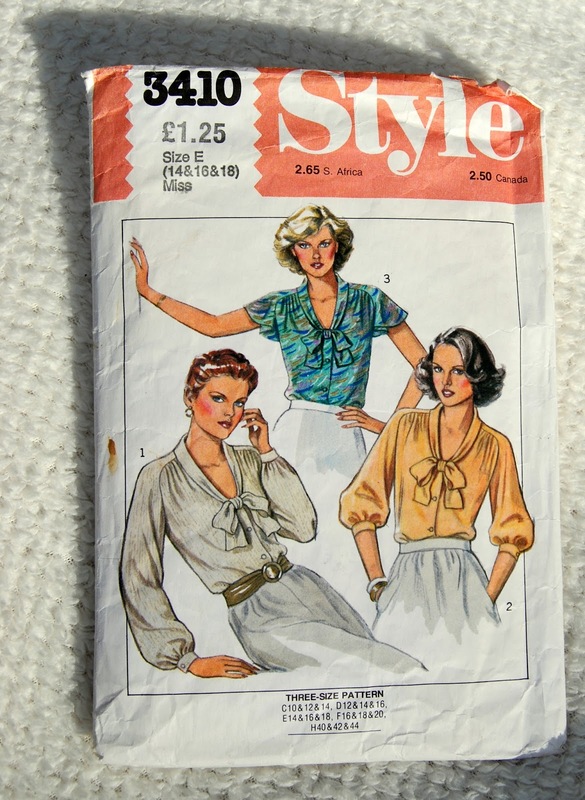 This is Style pattern #3410 from 1981. Usually I avoid the 80s like the plague, but this pattern seemed to be something that would work in 2015, too. Besides, it's a bow tie front and I looove those! 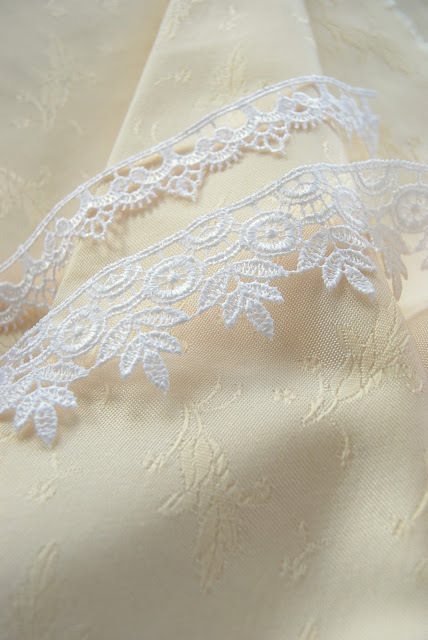 The fabric is a poly crepe chiffon, and I bought it thinking it was something else. I am terrified of chiffon, and it's shiftyness, so I was rather stunned when I got home and actually read the label! But I said to myself, how will you ever learn if you never try, and so I decided to make a blouse. I went slow, and I was quite pleased that it went so well. It was tedious to cut, as I didn't double the fabric, but luckily the small grid-pattern in the weave helped me keep the grain straight(ish). Besides, being a crepe makes it a bit less slippery. If I do make up this pattern again, I will add some lenght, because with jeans like this it is a little short (or maybe get pants with an actual rise!!!!!!!! ), but then again, it is meant for tucking into a skirt. I might throw in some darts, too, for good measure. The fluttery sleeves are fun and really cute, but I am tempted to make another with the mid lenght sleeve option. It is more fall-appropriate. Actually, the arm/shoulder construction on this pattern is really nice, the sleeve piece(s) form a yoke front and back, and looks great in real life. The gathers on front and back is also an elegant touch. The hardest bit of it all, was the tiny rolled hem on the sleeve edges. Oh man that was fiddly stuff! I did those by hand, and they came out great, in the end.....yay for small victories! So, I will call this a success. I love wearing this blouse, and it looks super with skirts. I've never been the typical girly girl. I don't wear dresses most days, and I probably spend less time in the bathroom than my better half. I rarely pour over fashion magazines, to get the latest look (obviously). Nor does my closet look like a party. Phantom of the Opera costume, 2004. 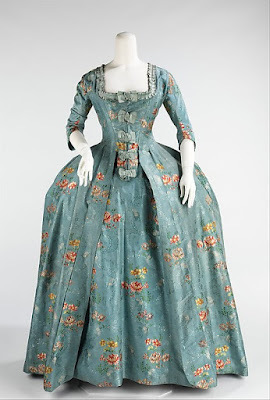 But when I see historical clothing (17th, 18th and 19th century), the frilly, romantically clad, corseted, drowned in bows and lace-monster in me awakens. I just can't help myself. In high school I had art history classes, and they were some of my favorites. 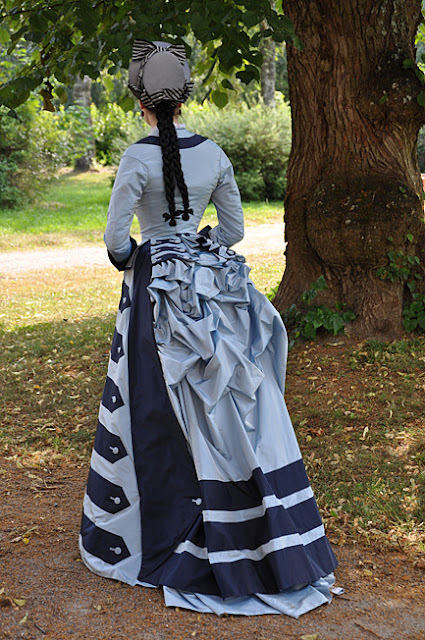 So naturally, I've been following along on some excellent costuming blogs the last few years. American Duchess was probably my first, and has been a well of inspiration since. And when you find one, you are sure to bump into more, like The Laced Angel, The Dreamstress, Historical Sewing, Before the Automobile, Wearing History and many more. These are some incredible talented ladies, and I think you will appreciate their skills even if you aren't into historical fashion. Robe a la Francaise 1760-70, MET. The most obvious hurdle for even starting making such garments, is "where the h*ll do you wear them?" This has been what has kept me from falling down this historical rabbit hole long time ago. And I am sure others have had this very thought, too. There just isn't any occasion to wear a full Victorian outfit around where I live. So how do you justify making something that will mostly hang in the back of your closet? Not to mention the cost and the time consumed on such large projects. Well, I haven't been able to answer these questions until now. I've come to the conclusion that I don't need a reason to do it. other than I really want to! And if there aren't any events to wear costumes, well maybe I need to make one happen? 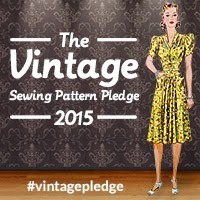 There might just be more lone seamstresses sitting around, looking for a reason to "jump in". Also, if you disregard the wearing-bit, there is also the inevitable learning process. it is a unique opportunity to up your sewing- and fitting skills. 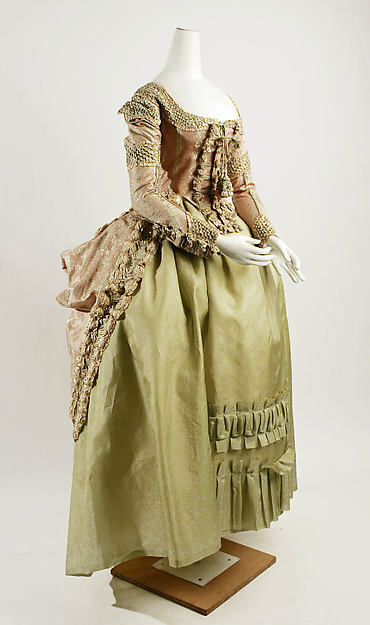 Just by reading costuming blogs, I've already learnt a lot about construction techniques and also the evolution of clothing and fashion through the ages. And it is very interesting. I've had the hardest time with this one, as I find I kind of love everything! 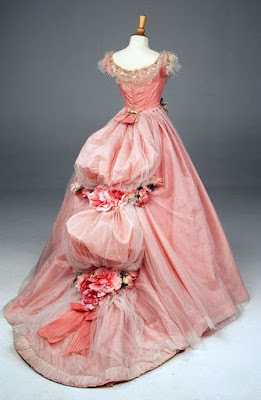 But I think I have managed to narrow it down to the late Victorian era (1870-90ish). And I tell myself, this is just where to start. Who knows what other eras I'll eventually end up making? 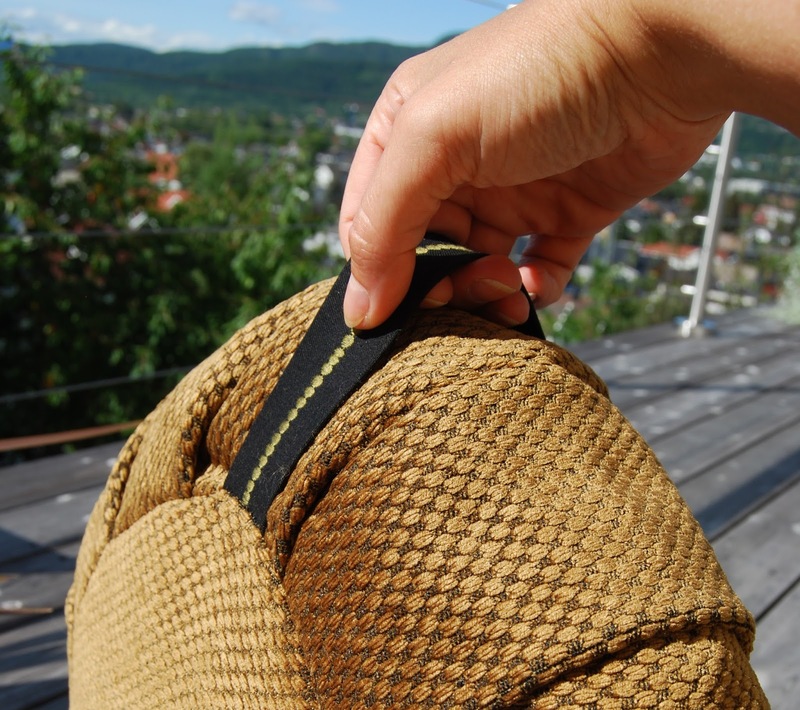 A scrappy idea - a Zafu meditation pillow! I don't know about you, but I have certainly come to a point in my life where I am slowly but steadily beginning to feel the age and its effect on my body. I have noticed that it takes a bit of effort to stay in shape, and most importantly if I don't make the effort, I suffer for it. I am not talking weight here, I am talking bodily well-being, and being able to perform daily tasks without straining myself or getting injured. As your body ages, it changes. 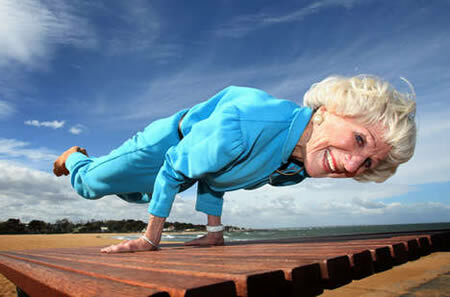 And after a certain age, you start to loose muscular strength and bone density. This is probably why your strong, perky twenty-something body demanded way less healthy attention, and withstood late nights, endless dancing and lack of sleep, without so much as a whinge. Enter the 40ish, creaky, stiff and hobbling-lame-in-the-morning-body... (twenty-something; stop laughing!!) For me, my bodily well-being is important. I like being active, and able to be active. I have a physically demanding job, and so I am dependent upon my health to earn my living. I also think of my life after retirement. I want to be strong and healthy even then, so I can enjoy my senior years, too. I did run for a year, loved it, but managed to seriously injure my ankle, and so running is off the table for a good while. So, I started doing yoga. Those of you who are on "the path", will give a consenting nod when I say that yoga looks deceivingly easy and pleasant. My first few practices were rather humbling. I am not at all as mobile and strong as I thought. But that's ok, it's a journey and I will get better. If you are wondering where the pillow comes in, I'll tell you. I discovered that just sitting tall on the floor, legs extended in front, keeping the natural hollow in my lower back was impossible. Also, sitting crossed legged, with a straight back, also not happening. Solution is to sit up on something to elevate the hips. I got tired with the uncomfortable folded towel, and decided I needed something a bit more fancy. Enter the Zafu. 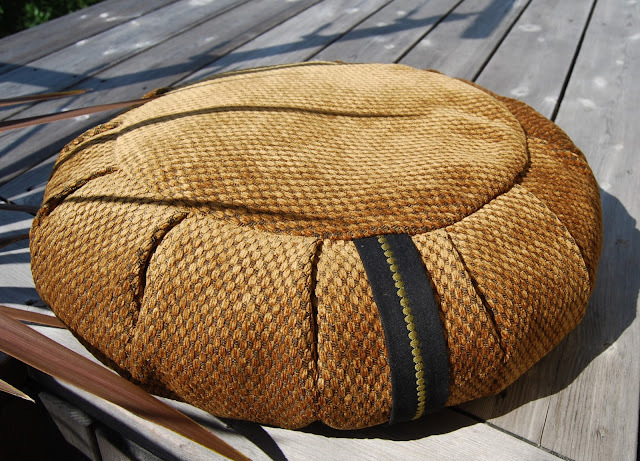 A Zafu is a traditional round pillow used by Zen buddhists during prolonged seated meditation. It is usually about 35cm (14") in diameter and 20cm (8")high, and stuffed with natural fibres like kapok, or buckwheat hulls. A little search online, and it was quite clear that natural fibres are rather expensive and hard to come by. But then I remembered this brilliant tip from Debbie, using fabric scraps for stuffing, and decided combine the need for elevated seating, and somewhere to put all those scraps! I am sure, as someone who sew, you are never short on scraps... I used a whole shopping bag just for this one pillow! The pattern for this is fairly easy to make yourself, but I found mine here. I just used the instructions for measurements, but I made the pleats just how I saw fit. I found that if you overlap the ends by about 5-6", there is no need to sew it shut. This is practical if you need to put more stuffing in, or take some out if you need to use the scraps. I just made sure the pleats were evenly spaced and the overlapping edge was taken into account, to make it invisible. My pillow ended up with eleven pleats, plus the edge of the panel forming the twelfth. I used upholstery fabric, but any sturdy fabric will do. 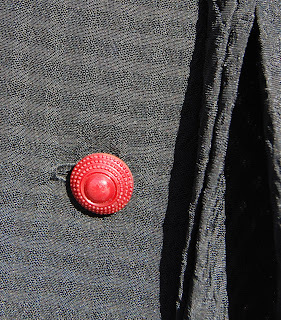 Just make sure it can be eased, as I found I needed to, when sewing on the top and bottom circles. When assembled, just add stuffing until firm. Using smaller scraps is best, as it is less likely to get lumpy. I also added a handle strap for carrying. I used a decorative stitch on my machine to make it prettier. If you take meditation classes, I guess you could embroider your name on the handle too. If you don't even meditate, or do yoga, the pillow looks great sitting on the couch, too. I've even used it to rest my laptop on when sitting in a recliner. I am very happy with my Zafu. Using fabric scraps for stuffing, makes for quite a heavy pillow, but I don't mind. It is a bit like a medicine ball :) I just "beat it up" once in a while to keep it fluffy(ish). Yes, yes I'm still here. Unfortunately, I've hit a major slump after the summer holidays and seem to have a hard time getting motivated. I guess that's a normal autumnal occurrence. I've had a lot of "life-stuff" on my mind lately, and is mostly related to work. If you came here today, hoping to read anything sewing related, I am sorry to disappoint. Feel free to skip the rest, but I just need to vent. I work at a cable factory, owned by a major international company. It is an industry highly dependant on the offshore- and oil industry. As you may, or may not know, there is kind of a crisis going on, and it is directly affecting my work place. A few weeks ago, we were told that because of the failing market and the oil price plummeting, 45 people are loosing their jobs over the next few months. We don't yet know who those people are, but I don't feel entirely safe. Both me, and my partner work at the same place, so worst case scenario; we both loose our jobs. I don't quite see that happening, but in that business you never can tell. Norway is an expensive country to manufacture goods in, so our Italian owners could very well decide to just move the whole shebang to another, low-cost country. So naturally, I am not quite at ease before we know for sure. I am trying not to let it affect my personal life and spare time, but it is hard. On another note, I am thinking about doing something different for a living. Wouldn't it be great working with something that is a little bit closer to my interests? Maybe this could be an opportunity? If I am beeing totally honest, I don't even like my job. I feel like I am wasting myself, and my health. I only do it for the paycheck. I do know lots of stuff, and consider myself fairly talented. There are very few things that I can't handle. I have some years behind me successfully keeping a job, so I wouldn't be the most hopeless person to hire. But you still need to convince someone. Self doubt is very much a companion these days. In my search for new employment, I actually came across two positions involving sewing. Sadly, the pay was really bad, and I ended up not applying. Have you ever been in a similar position? Did you ever decide to take a blind leap? How did it go? Did it end up life changing? I am trying to instill in myself, the belief that no matter the outcome, it will be for the best, and is only another opportunity. First I won a lovely knitting pattern made by the very talented Kristin Jones over at Sew Classic (if you like the pattern, it is for sale at Ravelry). If you don't knit, you can have Kristin knit it for you!